A group from Destiny is left behind on a planet when the ship enters F.T.L., and must find a Stargate route back before the ship leaves the galaxy. Lt. Hunter Riley is using a kino to document the search for Destiny‘s missing personnel (“Human”). Working on a solution, Dr. Nicholas Rush has no time. He’s concerned that the next time Destiny drops from F.T.L. flight, they might be out of range of the planet on which Lt. Matthew Scott, MSgt. Ronald Greer, Eli Wallace, and Chloe Armstrong are stranded. Suddenly, the kino falls to the deck. Adam Brody’s holoscreen goes dark. Lights go out all over the ship. Destiny has begun saving power, despite the fact that power reserves are near capacity. Rush suspects that the automated power-saving mode indicates that the ship is about to enter the enormous void between galaxies, where it will not be able to recharge using a star. Regaining limited control over the power systems, Rush and Brody show Colonel Young the bad news: Destiny will make only one more stop before leaving this galaxy. If they can’t retrieve the lost team during this final drop, they will be lost for good. When Destiny does stop, it’s for only a three hour window. Rush and Lt. Vanessa James lead a rescue team. Since each Stargate has a limited dialing range, they will work their way back through the gate network, going from planet to planet, hoping to find a path to the planet where Scott and the others were left behind. On that planet, Scott and the others are trapped in an underground maze. The stone ceilings shift, threatening to collapse. They have two days of water left. Eli is worried that Destiny could be beyond the cluster of Stargates within range. The ship travels in one general direction, despite occasional meanders. If they escape the tunnels and try chasing the ship through the Stargates, they have a 50/50 chance of even choosing the proper direction to go. During a rest break, Greer spots another large spider. Quickly, they move on. At a tunnel fork, Eli connects suddenly with his missing kino. He doesn’t know where it is, but sees on his control display that it has found a stone ladder leading up to the surface. Scott opts for the left fork. Chloe agrees, revealing that the occasional plaques on the wall may be “You Are Here” maps. Excited, Greer checks for another plaque. He finds one that confirms Chloe’s theory and returns — just as the tunnel ceilings convulse again. He is knocked unconscious and partially buried on the other side of a pile of debris. Horrified, Lt. Scott and the others try to remove the rubble and radio Greer — but there is no response. All the while, small pieces of the ceiling continue to fall. Scott finally orders the others down the available tunnel. They locate the kino and escape to the surface. Even as they reach the Stargate, Scott watches for Greer. They hesitate for a few minutes, uncertain as to whether to stay put or try to find Destiny. Eli chooses a direction and dials the Stargate to a (relatively) nearby planet, not knowing that Greer has regained consciousness in the tunnels below. Spurred on by terrible childhood memories of emotional abuse suffered at his father’s hands, Greer frees himself. He runs toward the Stargate. Scott, Eli, and Chloe step through the event horizon, and Greer just misses them. Without a dialing remote, he is stranded and alone. The others emerge on the next planet in a fog bank. They debate how long to wait there, hoping to be found by a rescue party, before moving on to the next planet. Suddenly a loud roar fills the air. The three escape through the Stargate as a giant, dinosaur-like creature lunges toward them. The next planet isn’t much better — a desert world whipped by sandstorms. Eli sends the kino to the next planet chosen from the few options available, only to find that it has a toxic atmosphere. Since they can’t retrieve the kino, they must now step blindly through the Stargate. Scott goes first, emerging onto a frozen world with breathable air. The others follow. Eli waits a few moments for his remote to update with the gates reachable from this planet. When it does, he recognizes one of the addresses: the planet with the alien shuttle, the planet on which Rush was stranded (“Justice”). It’s clear now that they have been traveling in the wrong direction, away from Destiny and Rush and James’ search party. From discussion with Rush, Eli knows that there is a star map to be found on the alien vessel, one that will better guide their planet choices. It might not be too late to turn around and catch up with Destiny, if it hasn’t gone back into F.T.L. yet. Despite their fear the aliens might be waiting (as they came for Rush when he accessed the ship), they step through the Stargate and locate the vessel. On board, Eli finds Rush’s discarded glasses. He boots up the computer, but the alien screens make little sense to his untrained eye. But Chloe, a former captive of the aliens (“Space”), recognizes enough to point Eli to the star map. The aliens have been monitoring Destiny‘s progress through the galaxy, and it will soon jump out of the galaxy and into the void. They hurry back through a series of Stargates in a desperate bid to catch up. Meanwhile, Rush’s group reach their tenth planet. There were more Stargates available to Destiny than Rush knew. With only one and a half hours left, James forms a second team to cover more ground. Night falls. Greer makes a fire. It reminds him of the fire which engulfed his childhood home. His father had driven him to another neighborhood at night and forced him out of the car; when he returned to their house he found his parents asleep in the burning home. Young Ronald saved their lives. He also recalls his father’s final days in a V.A. hospital, and his mother acknowledging that for everything Ronald’s father — a disturbed war veteran — gave him, he never let it change him. Instead of rebelling, Ronald joined the military to follow in his dad’s footsteps. Suddenly, the Stargate chevrons light up. Greer douses his campfire and takes cover in the bushes. Lt. James and her team step through. Relieved that Greer is alive, they quickly return to Destiny. But there are no leads on Scott, Chloe, and Eli. With five minutes left on the ship’s countdown clock, Eli searches the remote and discovers Destiny‘s Stargate address among the list of options. He dials, but Rush is also dialing in at the same time. Destiny connects with Rush’s Stargate, and the last of the search party returns home. Eli hastily dials again. But before the Stargate has finished dialing, the ship jumps back to F.T.L. flight and the address disappears from the remote. Once again, Scott, Chloe, and Eli are stranded. This time they have no hope of ever seeing Destiny again. On the ship, the Gate Room is awash in sadness. For Colonel Young, the loss comes on the heels of learning from T.J. that she is pregnant with his child. Greer heads to his quarters. Riley follows, attempting to document the moment, but Greer will have no part of it. Alone in his cabin, Greer sits down at the foot of his bed and sighs heavily. “As for Greer, many of you have expressed a desire to find out a little more about his backstory as well, what makes him tick tick tick. He’s one of the more fascinating members of the Destiny crew, a soldier’s soldier with an explosive volatility simmering just beneath his ice cool exterior. And, in episode 15, ‘Lost,’ we finally get a glimpse at Greer’s past, some of the events that shaped him as well, for better and for worse. This is the only episode of SGU in which Patrick Gilmore (Dr. Dale Volker) is not credited as appearing. VOTE! 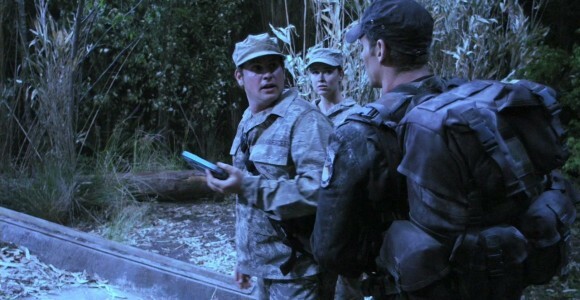 How would you rate SGU's "Lost?"